Hot this week: Italy displays the Becchina haul. When Should Antiquities Be Repatriated to Their Country of Origin? The skeleton isn’t illicit. It was in Belgium because of a partage agreement but Egypt considers it nationally significant and effected its return via diplomacy. Good job! The police officer allegedly received $275,000 as part of an antiquities smuggling deal in the city of Mansoura. Celebration at the return of the pre-Conquest Ekeko statue from the Museum of History in Bern. Rapa Nui (Easter Island) is seeking the return of Moai statues (yes, the giant heads) in foreign museums. They have approached museums in mainland Chile and the USA and say that this is only a start. Beyond just being restord, the church at the hacienda will be converted into a museum of sacred art as a number of religious works from other locations were brought there in the 80s and 90s because it was feared they would be stolen in their original contexts. A wooden door was broken, the tabernacle and various saints were vandalised, and gold medals and a ciborium were stolen. The crown of Santo Niño Jesús de Praga was taken from the Templo del Carmen in Celaya, Mexico. The crown was 50 years old and made of pure gold. A video exists of the theft. Two colonial bells were taken from the church at Calcauso by thieves using motorised vehicles. The US Supreme Court refuses to hear the museum’s appeal regarding the restitution claim for Adam and Eve by Cranach the Elder. Four have been formally charged with the theft of portions of a Chihuly sculpture from the Denver Botanic Gardens. The accused were ‘black-out drunk’ and broke in to the Gardens with no prior plans to steal the work. They dumped the sculpture in a field and it was destroyed by a corn combine harvester. A 19th century church bell was stolen from Bethel Grove CME Church in Griffin, Georgia. Locals speculate it was a metal theft for scrap. A description of Mimbres petroglyphs and bowls including their devistating mass looting. It took three years to repair a vandalised Monet. This is how conservators did it. One of many articles on the display of Becchina items returned from Switzerland. 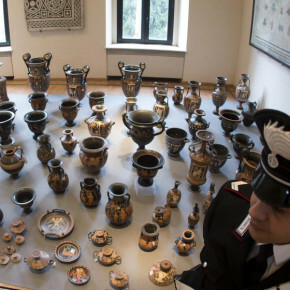 18 people were arrested in Campania and Lazio and 1500 looted artefacts were recovered. Allegedly these individuals were part of a gang of artefact diggers and two of the recovered pieces are amphorae attributed to the painter Assteas. The group of 19 people arrested (one up from the 18 mentioned in the last article) conducted looting along the boundary walls of Pompeii. Arthur Brand has received a photo of a 1629 painting by Jan Linsen which was stolen from the Westfries Museum in 2005. Around 100 artefacts were found by police searching a van at the Horgos border crossing. Seven Serbians were in the van which had Austrian plates. Three people have been arrested in Zaragoza for trying to sell fake Mirós, Picassos, and Matisses. This is the culmination of a large police operation to stamp out this faking ring. An electrician employed by the Cathedral admitted to taking it and the codex was found in a garage he rented. Now he says he never saw it before. A caravan filled with WWII gas masks and Victorian medical equipment was taken on the Isle of Thanet. Manannán Mac Lir, by John Sutton, was stolen and a wooden cross bearing ‘You shall have no other gods before me’ was left in its place. Brassware from the 19th century has been stolen from St Peter’s in Framilode, Gloucestershire only months after thousands of pounds were spent restoring it. General discussion of antiquities trafficking with an Australia focus. The acting director of the Vanuatu Cultural Centre has been accused of ‘bowing’ to threats made by a French antiquities collector. 16 Cambodian artefacts found among those seized from former Central Investigation Bureau Chief Pongpat Chayapan will be returned to Cambodia. Another 20 could go back. Five of the 16 statues seized from former Thai Central Investigation Bureau chief Pongpat Chayapan and returned to Cambodia are apparently fake. Silver taken from Anjaneya Swamy temple at Cheruvubazar . The piece, taken from Katauna village in Nalanda district, had recently been documented and it was announced that these photos would be transmitted to the Art Loss Register. They were stolen from Maharaja Ranjit Singh Panorama and an unidentified woman left them in Gurdwara Ramsar. Amazing news! The idol was found buried near Bajaora on the outskirts of Kullu. The piece was found based on information given by a suspect. Image of the very large number of devotees who came to support the cleaning and reinstalling of the stolen idols which were recovered this week. The man accused of stealing the recently recovered idol of Lord Raghunath from Kullu is said to be in Nepal, a country with no extradition treaty with India. These are mostly swords and mostly in private hands, as well as calligraphy books and sculptures. There are rules against selling these items but owners appear to have stopped complying. The Terauchi Collection, taken from Korea in the late 18th and early 19th century by a Japanese officer, has been partially repatriated and is on display. I believe this happened a while ago but I didn’t link to the story here. Here it is. The FBI involvement in the Milwaukee Strad theft case. On the theft and apologetic return of minerals stolen from Arizona’s Petrified Forest National Park. The wine stolen from French Laundry was ‘found’ in a ‘private cellar’ in North Carolina but no arrests have been made and the police aren’t saying much.